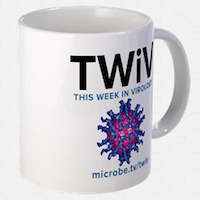 TWiV 294: Smallpox and anthrax and flu, oh my! The TWiV team reviews the discovery of old vials of smallpox virus at NIH, anthrax and influenza mishaps at CDC, the baby who was not cured of HIV, Cambridge Working Group, and sacking of NSABB members. The Twivsters discuss how reverse transcriptase encoded in the human genome might produce DNA copies of RNA viruses in infected cells.